In Armenia a layer of sheep dung in a cave helped protect the world's oldest known shoe. Buried in a pot 5,500 years ago as part of some ritual, the leather shoe was tied with laces and filled with grass that probably helped keep its shape. The same shoe design would go on to be used across Europe for thousands of years. Archaeological evidence suggests that sheep were domesticated about 11,000 years ago. Lamb is a very ancient food, and sheep were probably domesticated about 12,000 years ago. There is positive evidence they were domesticated by 8900 B.C. in Iraq and Romania. Some of the oldest traditional recipes come from Greece and date back several thousand years. The worldwide population of sheep today is over 1 billion, and is considered one of the most valuable of all the domestic animals. 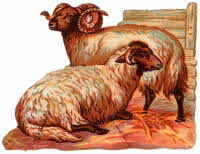 Wild forms of sheep are found in Europe, Asia, Africa and North America. In 1838 there were 1.6 million sheep in Vermont and 292,000 people. New Zealand has a population of about 3.3 million people and about 46 million sheep. Per Capita Consumption of Sheep in U.S.